Central Christian College of Kansas makes bachelor and associate degrees financially accessible. 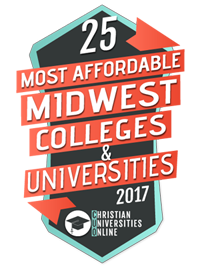 For individuals looking for an affordable two-year or four-year degree from a private, accredited institution with competitive tuition, consider Central Christian College of Kansas. CCCK's online programs have a flat rate of $425 per credit hour, for all online degrees and all programs. This means that you don’t have to second-guess or constantly “do-the-math” on what your tuition cost is or your cost per credit hour. Find out more about Tuition. Central Christian College of Kansas wants to work with you. 97% of our students receive some form of financial aid. Central Christian College of Kansas Online wants to give you access to the many resources available to finance your education. Learn more on our financial aid page. Military personnel, their dependents and veterans will want to explore the options available to them on our military aid page. Central Christian College of Kansas wants to set you up for success. Accredited by the Higher Learning Commission of the North Central Association of College and Schools, Central Christian College of Kansas was, until its transition to a four-year institution, the oldest accredited junior college in Kansas. Our online programs build upon our strong educational foundations and provide a virtual campus where you will gain a comprehensive education focused on academic excellence. Through transparency regarding tuition and financial aid, Central Christian College of Kansas Online works to provide the best value for the student. Just because you go to school online, that doesn’t mean the degree you earn is any less valuable or relevant. Central Christian College of Kansas Online graduates graduate with the same diploma our on-campus students earn. Have further questions? Visit our FAQs page or contact an Enrollment Advisor who can answer your questions.